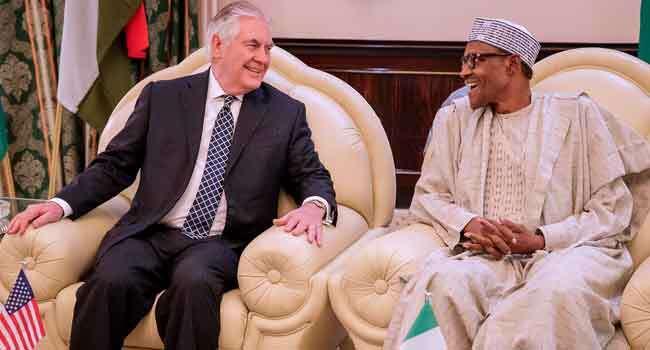 President Muhammadu Buhari has met with the U.S. Secretary of State, Mr Rex Tillerson, at the Presidential Villa in Abuja. 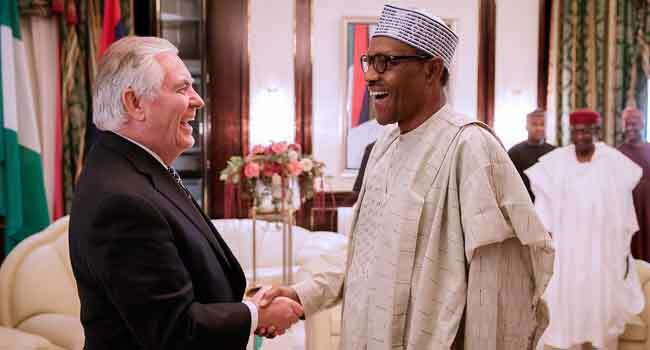 The President received Mr Tillerson on Monday shortly after the US Secretary of State has arrived at the State House, the Federal Capital Territory. 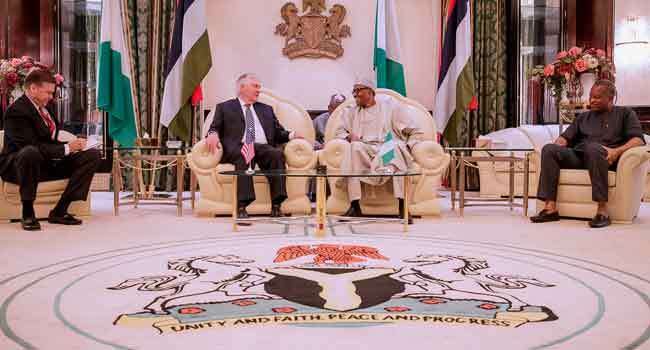 He thanked the United States government for assistance rendered in the fight against Boko Haram insurgency, especially in the areas of training and equipping Nigerian soldiers. President Buhari said Nigeria has chosen the option of negotiation over the use of force to secure the release of the abducted Dapchi schoolgirls and the remaining Chibok girls in the custody of the insurgents. He also vowed that his administration would continue to do its best to secure the country, and to ensure the forthcoming general elections are conducted freely without bias. 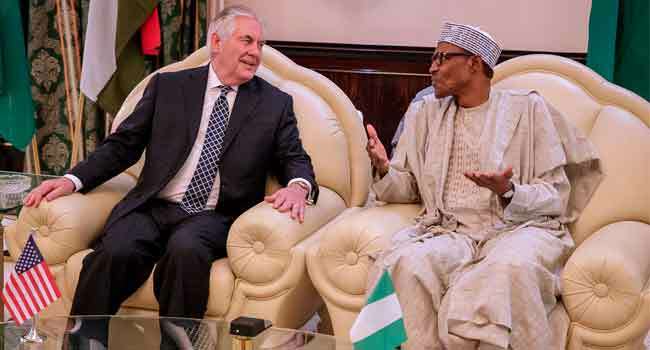 On his part, Mr Tillerson reaffirmed the support of the U.S. for Nigeria to ensure the speedy recovery of the abducted girls. He further urged Africans to explore U.S. alternative financing mechanism instead of taking loans from China, noting that Chinese loans need to be looked at carefully as they have failed to yield the desired result in other places. 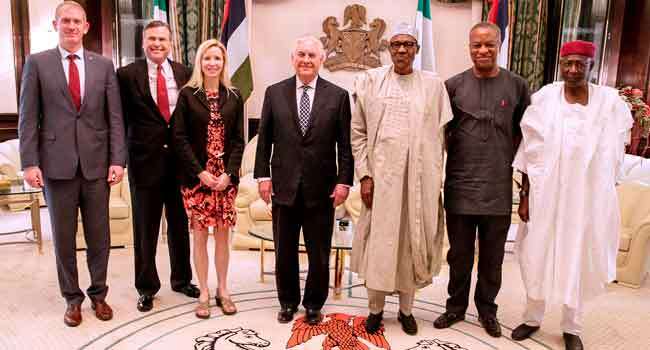 President Buhari welcomed the U.S. top diplomat in company with the Minister of Foreign Affairs, Mr Geoffrey Onyeama, and his Chief of Staff, Abba Kyari. Mr Tillerson was also accompanied on the visit by his Chief of Staff, Margaret Peterlin; Colonel John Walker, as well as the U.S. Ambassador to Nigeria, Mr Stuart Symington.